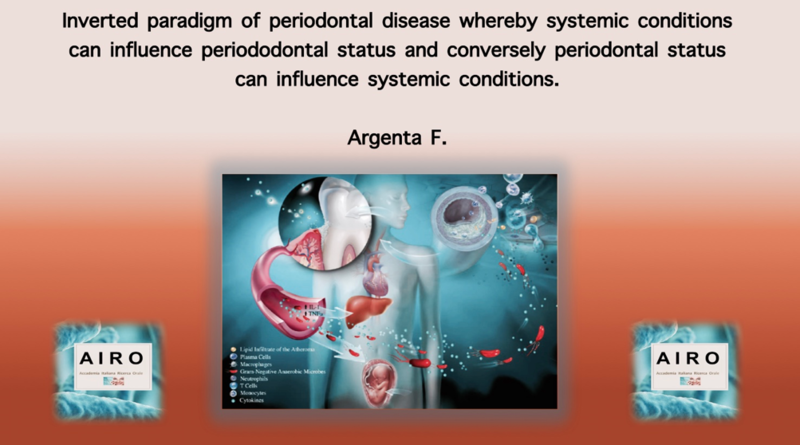 Periodontal medicine recognizes a “bidirectional” interaction between periodontitis and systemic conditions. The term “Periodontal Medicine” was first proposed in 1996 as a broad term defining an emerging branch of periodontology that focusses on relationships between periodontal health/disease and systemic health/disease . Now, 20 years later, the list of “associations” has burgeoned to unwieldy proportions. The increasing number of periodontal-systemic associations corrupts the ability of dentists to distinguish which of the associations are spurious and which are valid. In the field of periodontal medicine, the use of observational studies has become the prime method to identify possible associations between periodontal diseases and systemic diseases. An observational study interprets the effect of direct observations of subjects in their natural settings. Researcher has no control over variables. The observational studies can cannot demonstrate a cause and effect relationship, only identify associations and generate a hypothesis. In other words, the assignment of subjects is not directed by the investigators. The frequency of outcomes in an observational study is usually measured or estimate as relative risks, rate ratios, hazard ratios, and odds ratios. To confirm the validity of a hypothesis, experimental studies (e.g., randomized clinical trial) are necessary. Despite the limitations of observational studies, these types of studies can offer compelling associations that can be confirmed by robust experimental data. For example, observational studies supported use of coronary stents to reduce chest pain; however, stenting of coronary arteries for stable coronary artery disease was found to be no better than medical management of patients with this medical problem . This is one example of numerous reversals of medical practice that were originally supported by observational studies . Observational Studies Are Merely Observations. Currently, there are over 100 reported periodontal-systemic associations, and all of these relationships have been identified by observational studies. At this time, only one association (periodontal disease and adverse pregnancy outcomes) has been investigated using experimental studies with distinct, objective, clinical endpoints (not surrogate values), and the experimental studies failed to confirm a relationship . It is very likely that subsets of patients with periodontal disease could represent a group of individuals at increased risk for manifesting a variety of inflammatory-associated diseases. Chronic periodontitis may be risk predictor for coronary artery disease. A risk predictor is a characteristic associated with elevated risk but not necessarily an element in the causal chain of events. In this context, disease associations may be just as important as causality relationships in the sense that identifying individuals at risk of having one or more systemic conditions may help in their overall clinical management. In the same way that multiple diseases may align with each other, the concept of syndromic relationships arises. Given that a syndrome is a group of symptoms that collectively indicate or characterize a disease, psychological disorder, or other abnormal condition, various periodontal and systemic conditions could fall into the groupings associated with a syndrome . In a similar manner, it has been proposed that associations of periodontal diseases and systemic diseases may be a syndemic relationship . Syndemic refers to a set of two or more linked health problems that interact synergistically to cause an excess burden of disease in the population. In an attempt to clarify the current evidence for relationships between periodontitis and systemic diseases, a joint summit of the European Federation of Periodontology and the American Academy of Periodontology met in 2012. [11•]. Specifically, relationships between periodontitis and cardiovascular disease, diabetes mellitus, adverse pregnancy outcomes, respiratory disease, chronic kidney disease, rheumatoid arthritis, cognitive impairment, obesity, metabolic syndrome, cancer, and other associations were considered. From the deliberations of this meeting, it was concluded that there was evidence in the literature to support the concept that periodontitis is associated with some, but not all, of the diseases and conditions reviewed. Dentists can begin to ascertain how periodontal diseases relate to systemic disorders using a “Disease Association Checklist” (Table 1) to create a simplified register of criteria that allows for rational assessment of disease associations. When all of the available data are assembled and imported into such a sieve, patterns will emerge with regard to how robust the evidence for various periodontal and systemic interrelationships can be accepted to support meaningful relationships. By using the Disease Association Checklist, supportive evidence exists for an association between periodontitis and diabetes, cardiovascular disease and rheumatoid arthritis, equivocal evidence of an association between periodontal disease and obesity, or adverse pregnancy outcomes and negligible evidence for osteoporosis (Table 2).